Be sure to check me out and enter to win my first giveaway! I will not longer be posting at this site so be sure to take note of the new web addy :). It has been several days since I last posted unfortunately. While I have been really busy, the main reason for this is that my husband stole my SD card from my camera! For most people this would be a simple fix….just run to Wal-Mart and buy another. However, since Wal-Mart is about 40 minutes from my house, and since I have been covered up in work and school, I just haven’t found the time to take the much-needed trip. So camera-less I am for now, but don’t worry! I plan on going tomorrow so I can get back to my picture-taking self! I have really missed blogging this week. There were exciting things happening that I totally wanted to document in pictures! It’s interesting how much you realize that blogging balances you once you stop doing it. I need my balance back :). The husband is sick sick sick with a cold! 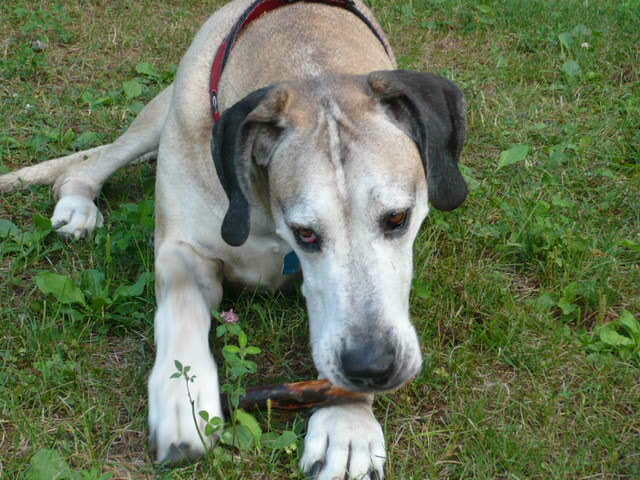 He has been in Mass all week, but he comes home today, so I am hoping that I don’t get it! Moose was quilled by a porcupine last week and this week the vet discovered that one of the quills is lodged in a tendon of his leg. Poor guy is having a tough time walking! But it should dissolve. I tried my 1st Green Monster! Unbelievable. You can’t even taste the spinach! I finished one of my most favorite books. I really hate finishing good books! I started physical therapy for my knees! And the PT said I could run again but had to stick to dirt roads and flat surfaces. Yessssssssssssss! Well my friends, that has pretty much been my week. I can’t wait to upload some pics tomorrow :). 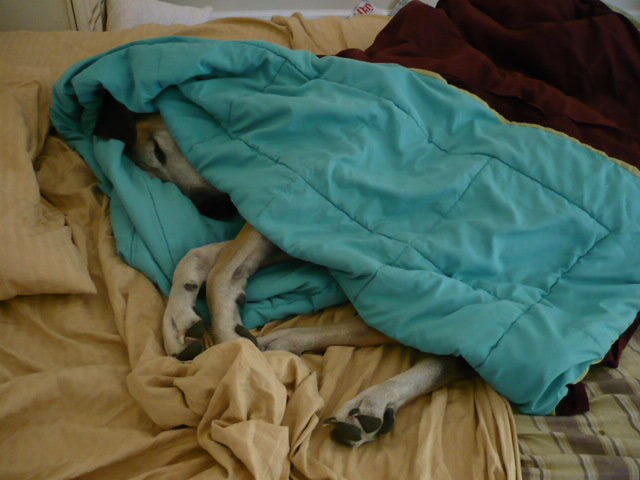 Today the husband comes home so I will be hanging out with him all day as he leaves out again tomorrow. TTYL! Today has been a great, lazy day. For lunch, I gave veggies a break and had a nice steaming plate of lasagna. A little Italian food does the body good! For dinner, I am making a roasted veggie plate including carrots and potatoes. Roasting veggies is simple as long as you follow some easy rules. 1. Always use parchment paper. Trust me on this one! I spent too many years scraping away chunks of veggies from my baking sheet! Parchment paper is magical. So far, nothing I have ever cooked on it has stuck. 2. Seasoning is your friend. To me the best veggies are well-seasoned. 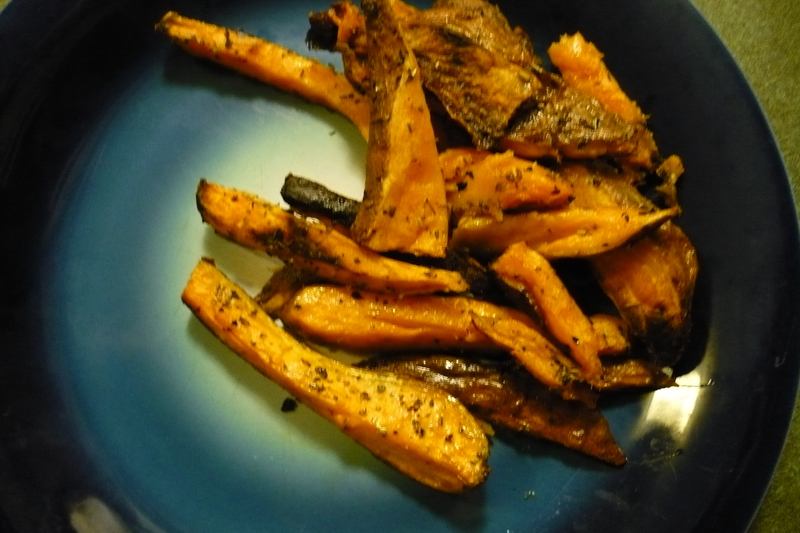 For sweet potatoes and carrots I use Italian Seasoning. For roasted french fries I typically just use Seasoned Salt. Experiment with seasonings and find what you like best. 3. Cut ’em up! The most successful roasted veggie will be cut into small pieces. 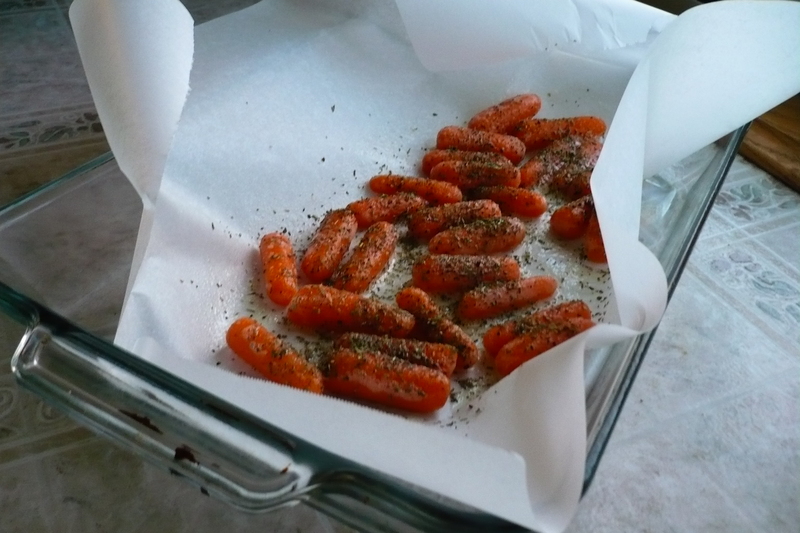 Don’t try to roast veggies whole, except maybe carrots……to be safe, just cut them up! 4. EVO. In my opinion, roasted veggies taste best with some extra virgin olive oil brushed over them. However, at desperate times, I have been known to just spray them down with non-stick spray, which works! 5. The longer the better. 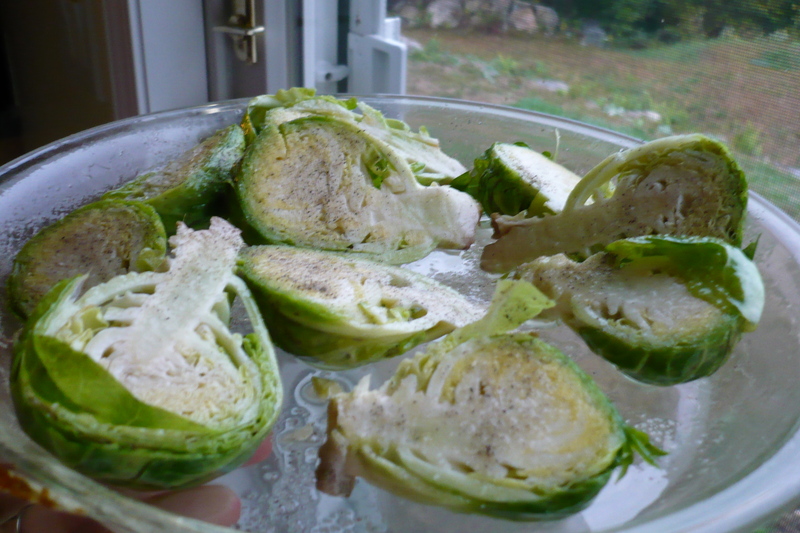 Most vegetables are very firm, thus it takes time to roast them until they are no longer hard-as-a-rock. Of course, timing depends on the vegetable and your oven. I make sure to give my veggies plenty of time to roast (and I admit, I kinda like the slightly charred veggie!). 6. Heat baby. I crank my oven up! Usually to 400 degrees. I stay away from going any higher than that because parchment paper can only handle up to 420 degrees. I feel that 400 degrees is the best roasting temperature. Today I was craving BBQ! I miss the mouth-watering pulled pork of the South so much. Every year when I head home to GA, I have to hit up a bbq stand. And I chow down on a huge sandwich like there’s no tomorrow :). 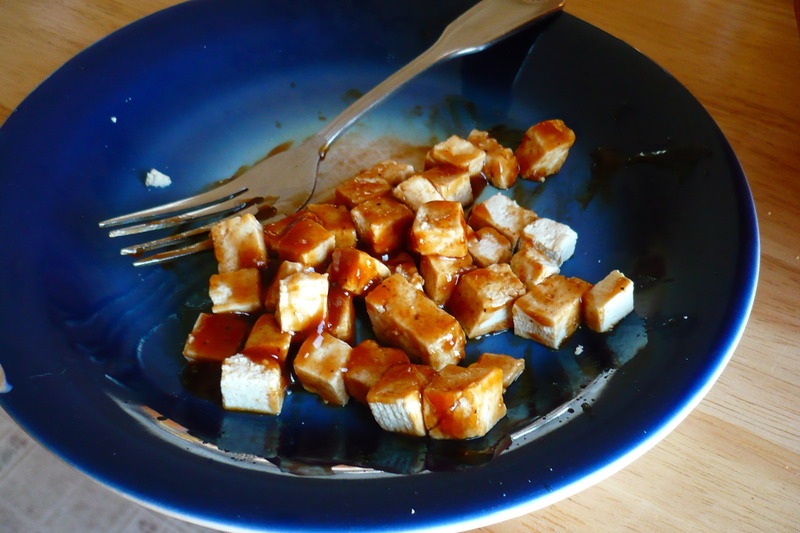 For lunch, I thought I’d try to make some bbq flavored tofu. 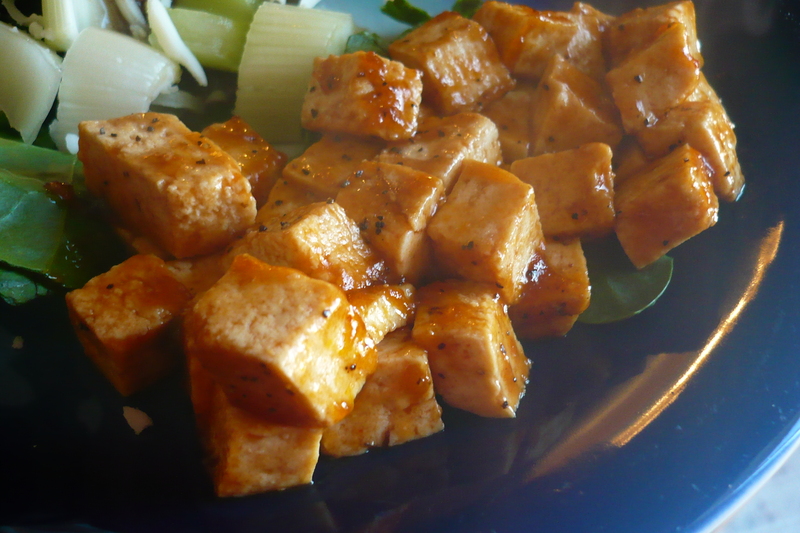 First I gently pressed the tofu cubes with a paper towel to get out any remaining moisture. Then I added about 4 tablespoons of bbq sauce and gave it a quick stir with my fork. I don’t have a favorite bbq sauce…..yet. 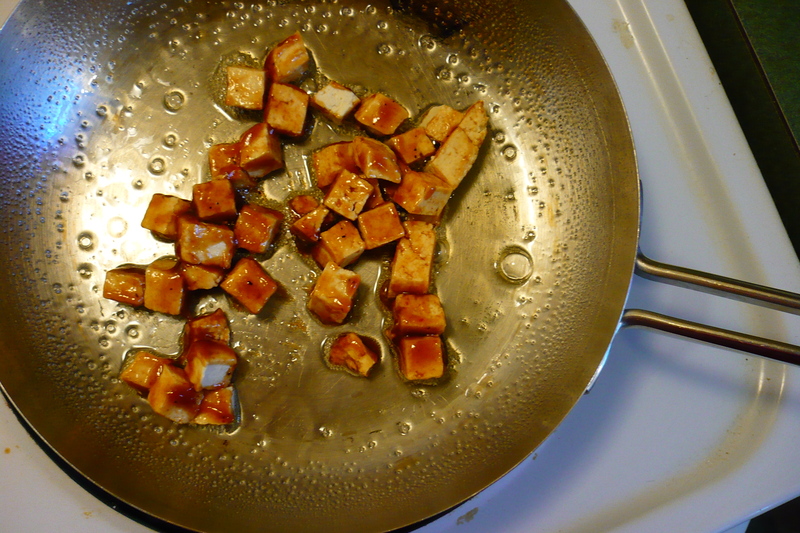 Then I put the tofu in a pan sprayed with no-stick spray and cooked for about 5 minutes over medium heat. I just walked for 45 minutes on my elliptical. It really helped to watch some of my favorite shows on TV so that I didn’t get super bored. Thank god for DVR! 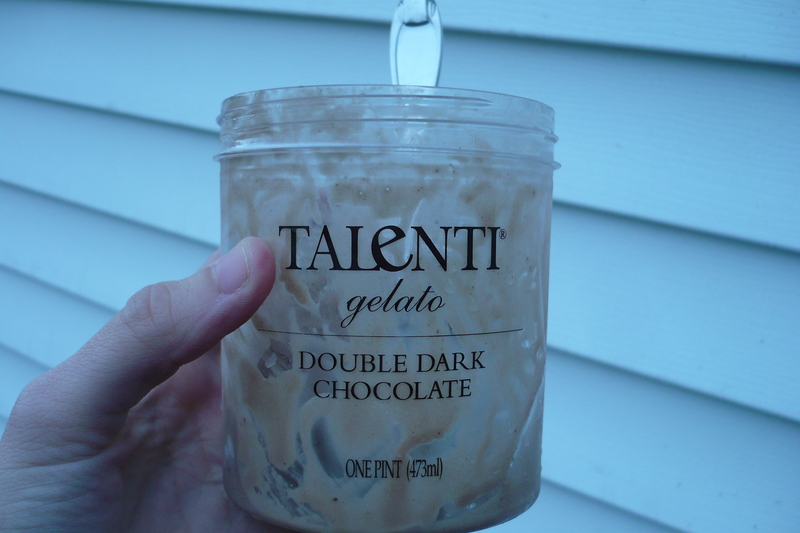 Gelato is considered a healthy dessert for a variety of reasons. The most obvious is it’s made from natural ingredients. From fresh hazelnuts and pistachios to the milk and water, gelato contains ingredients that are all found in nature. Each ingredient in gelato contributes to its overall nutritional value. While the nutritional content of every cup of gelato consumed isn’t always the same, here are a few health facts about gelato. Off to go walk on my elliptical! Please head over to Voice in Recovery and read about a 21 day challenge for self-care! I’m loving the Voice in Recovery blog! I wasn’t too familiar with the term “self-care” until I began working in the mental health field. However, now, I practice it pretty regularly. I am excited about this 21 day challenge! Self-care is a process of taking care of yourself physically, mentally, and emotionally so that you avoid burnout in life. As a therapist, it can be very difficult for me to listen to emotional and traumatic experiences from clients for 8 hours a day. And sometimes, it is hard for me not to feel depressed and mentally drained by the end of the day. Thus, it is essential that I maintain especially good emotional and mental self-care. Therapists are not the only ones that need self-care. We all do. So many people experience stress on their jobs, financial stress, relationship strains, fatigue…the list goes on and on! But how often do we take time daily to take care of ourselves? Most of us are just too dang busy for this. I encourage you to take part in the 21 day self-care challenge. You will be amazed at how much more fulfilling your life will be by just spending some time and efforts focused on you each day. being sure to talk to the husband/friend/or family member if I need someone to talk to! 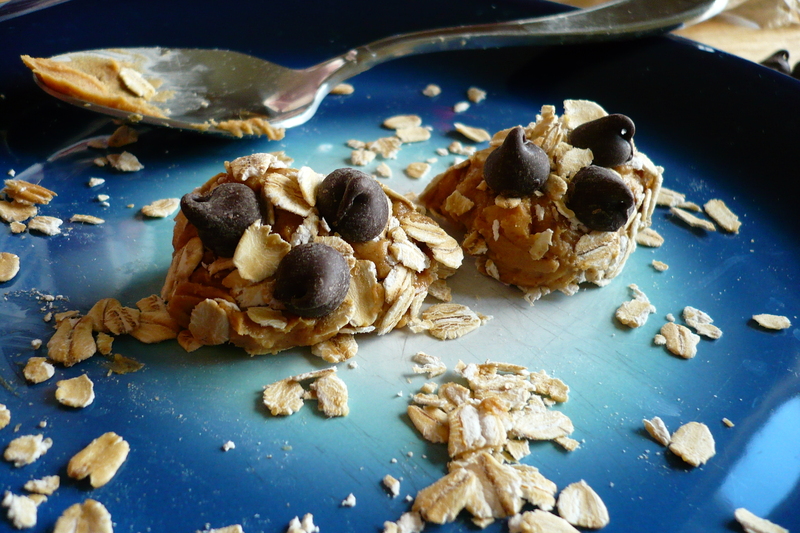 Inspiration from Giada + Moose. I love, love, love the show Everyday Italian by Giada de Laurentiis. Yesterday I was watching it and couldn’t help but crave some good ole spaghetti. While I wish I had the time to make the kind she did, I just grabbed some healthy noodles and canned sauce from the store. 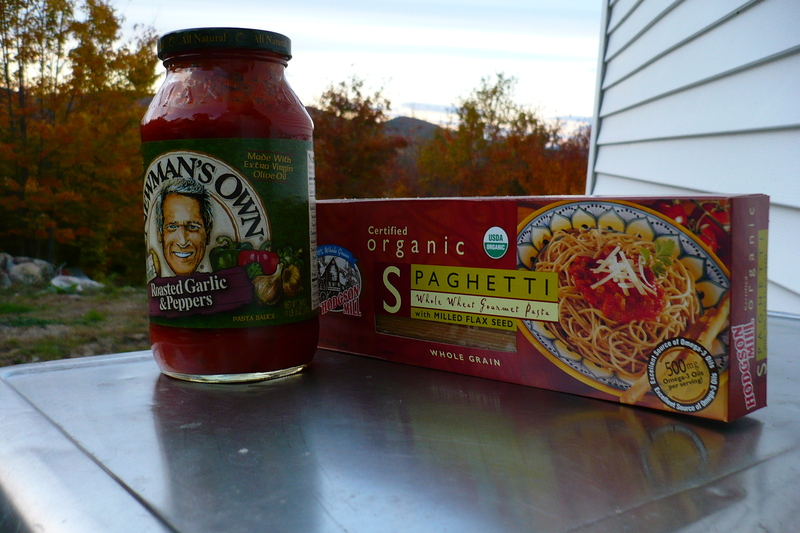 I have never had Newman’s Own spaghetti sauce. I love how they donate to charities, so I bought some at the store on sale for $2.50. It was fantastic! Of course, I’m not too terribly picky when it comes to spaghetti sauce but I appreciated how the flavors of garlic and peppers were so prevalent in this sauce. 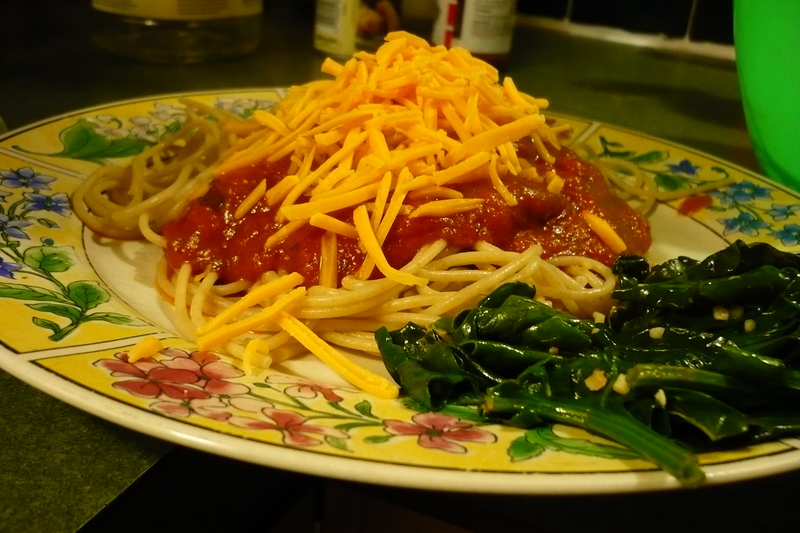 As you can see I also had some spinach that was sautéed with garlic. This was a tasty and filling meal. 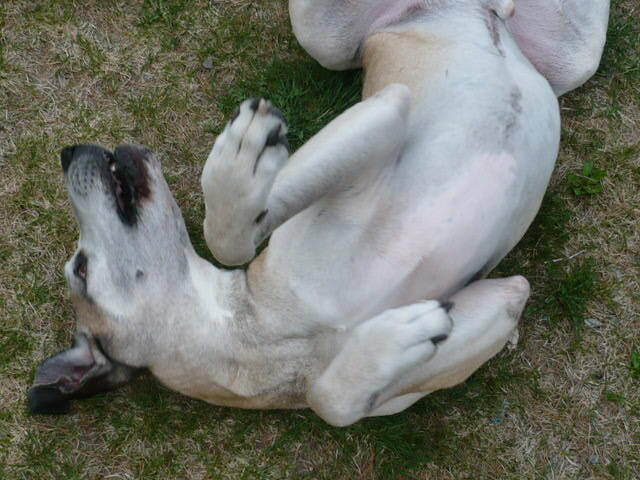 You would think this pose hurts his neck, but he loves it! He’s totally knocked out right now! He had to have several incisions and stitches so he will be feeling lousy for a few days. 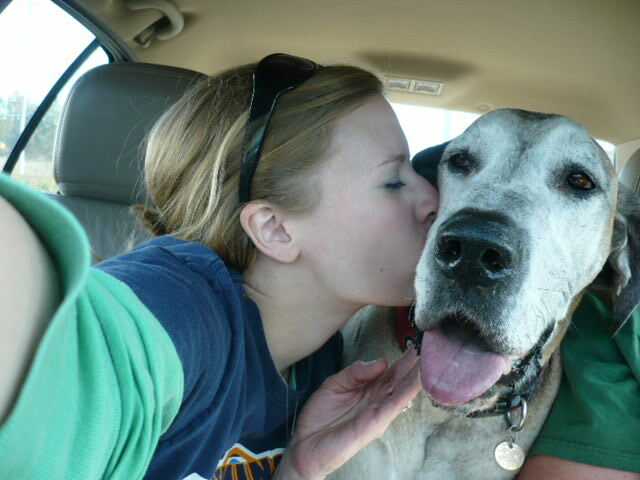 But, he should be back to his loving self in about a week. I’m so glad he’s OK! 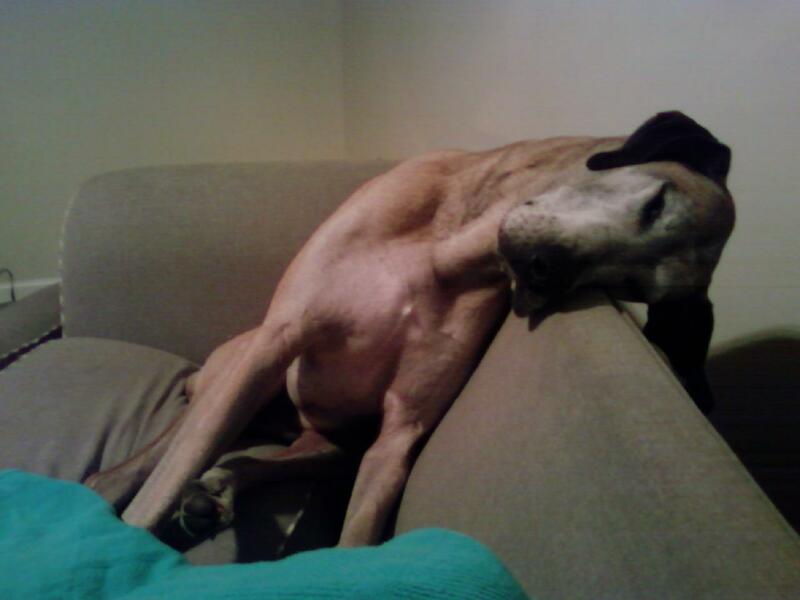 Now off to bed I must go. Sometimes I need a sweet treat. Other times I need a quick-pick-me-up. 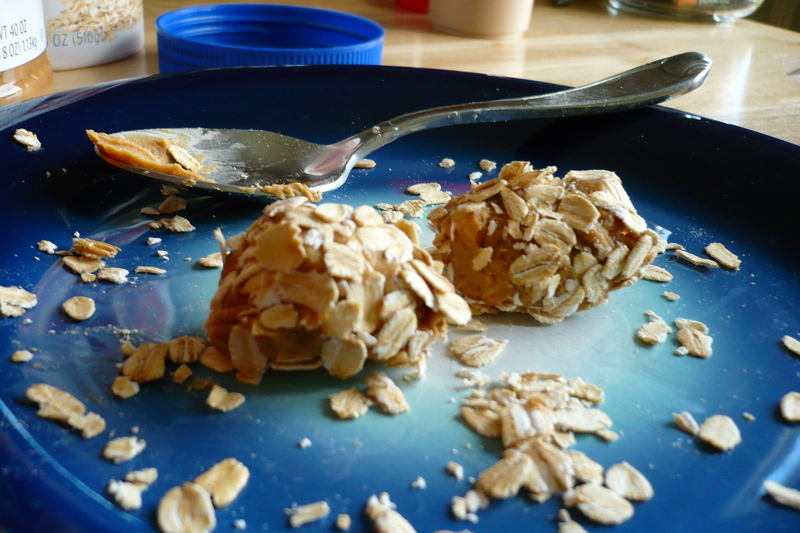 In these desperate circumstances, I make what I call “Lame Peanut Butter Balls”. And, I love them. Why are they lame? Because they do not require any fancy ingredients. And maybe because it only takes three steps to make them. Who ever said lame didn’t taste fantastic? 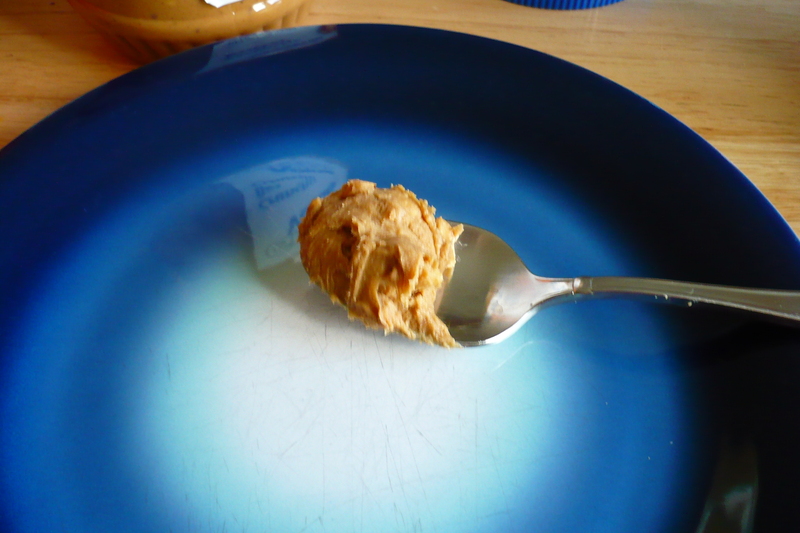 Step 1: Get a spoonful of peanut butter and plop it on a plate. 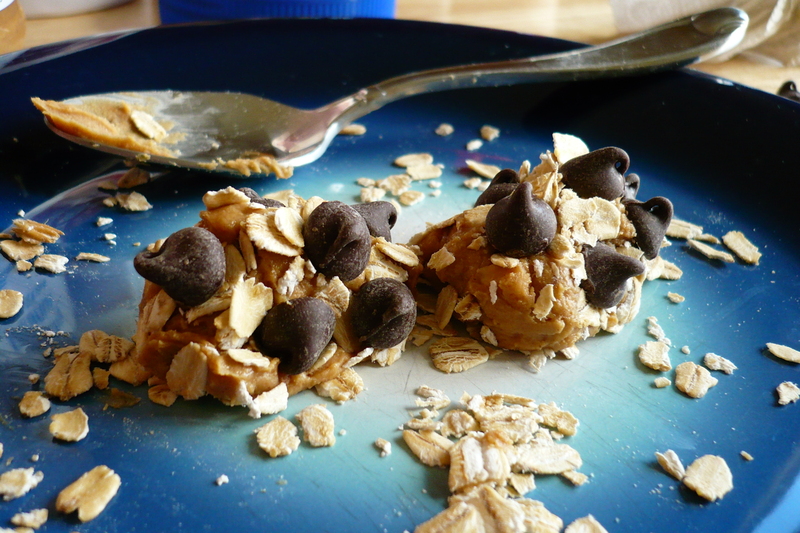 Step 2: Sprinkle peanut butter with rolled oats. It’s okay to make a mess. 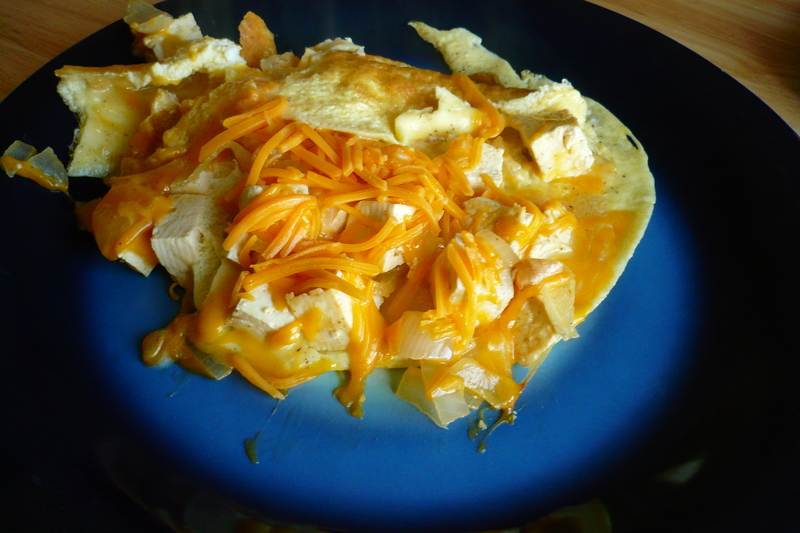 One of the highlights was the open-faced omelet I made for the husband. It was so full of goodies that I couldn’t get the side to flop over like it should!! Super easy to put together! 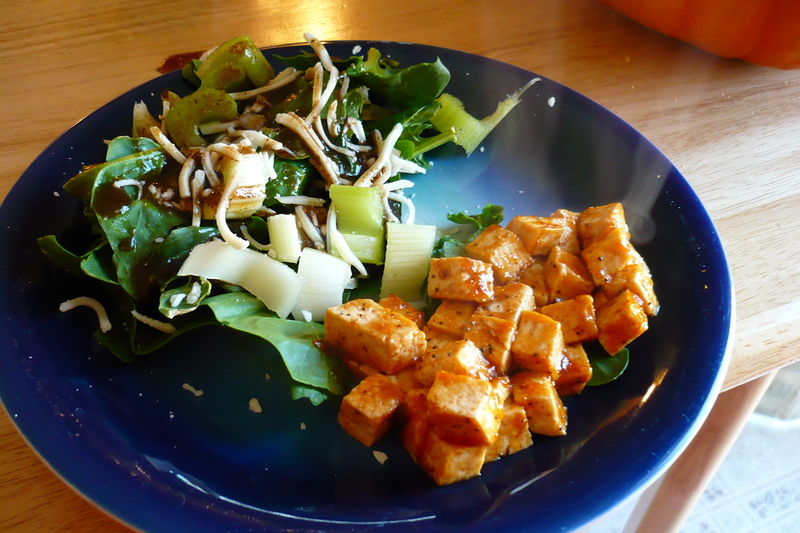 For the best taste, I sautéed the onions and tofu together in olive oil. 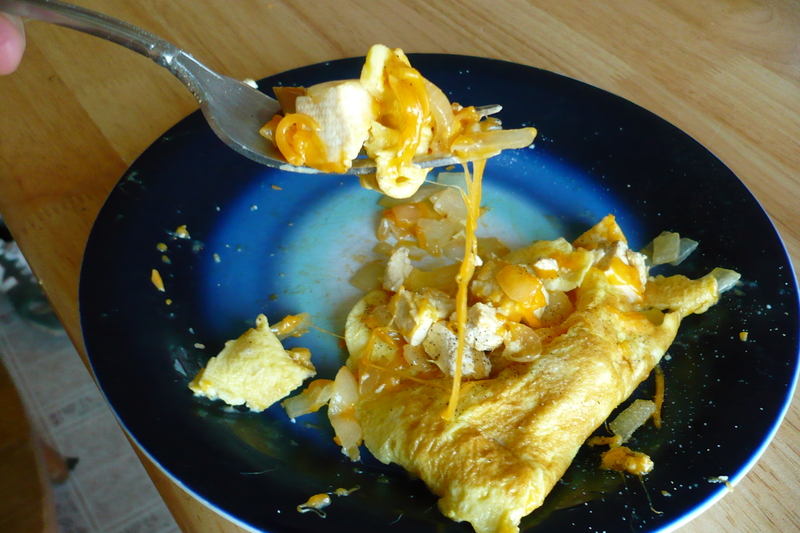 The husband loved, loved, loved this omelet. I was so pleased that it turned out so well. 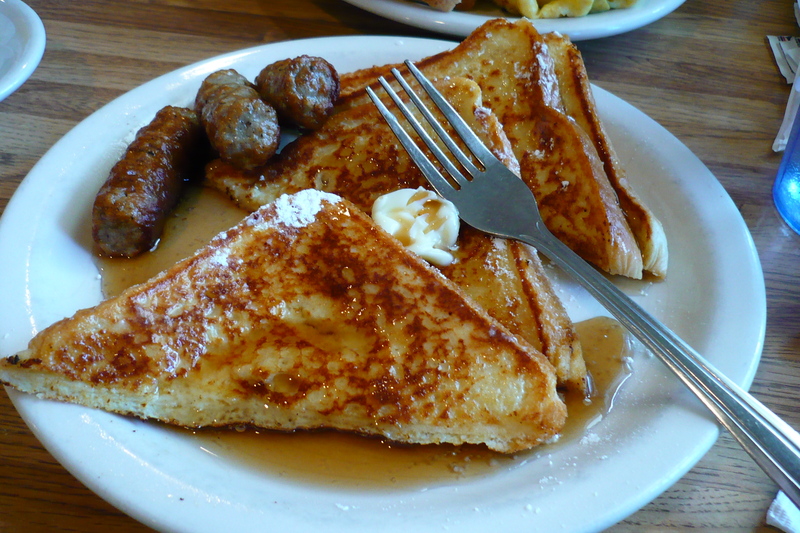 We had this on Sunday morning at about 10am and it kept us full until dinner! 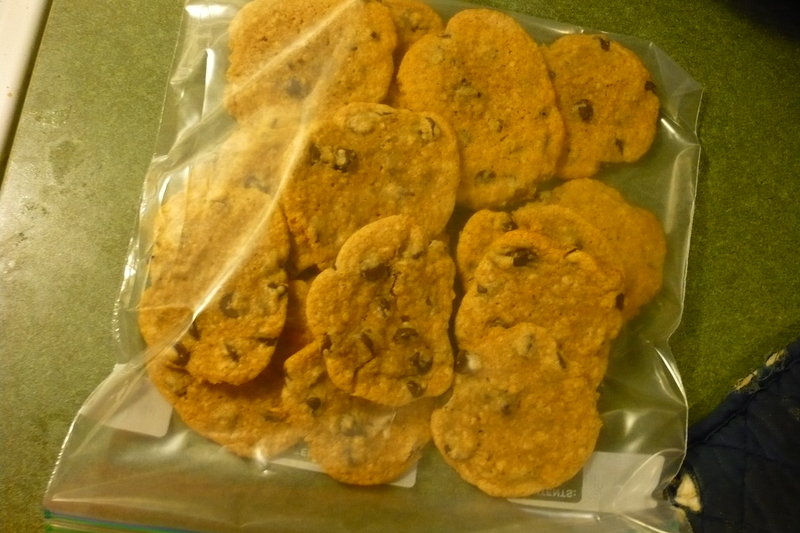 I also made a batch of cookies for the husband to take with him this week. Best Wife Ever. Lol! We also got our pumpkins this weekend, and I was able to find a perfectly plump one :). Can’t wait to carve it next weekend! It’s pretty rare that the husband and I go out for breakfast. But today we broke the norm and headed to Lazy Susan’s Restaurant. Thank heaven we did. Picture a somewhat worn building where all the locals go to feed their stomachs. They only take cash, and they don’t have a website. My kinda place. This was the first time I have eaten any meat all week. My husband watched in humor as I cleaned my plate. Tonight we are relaxing, munching on some appetizers, and watching a movie. He leaves out again tomorrow, so I am enjoying every moment. 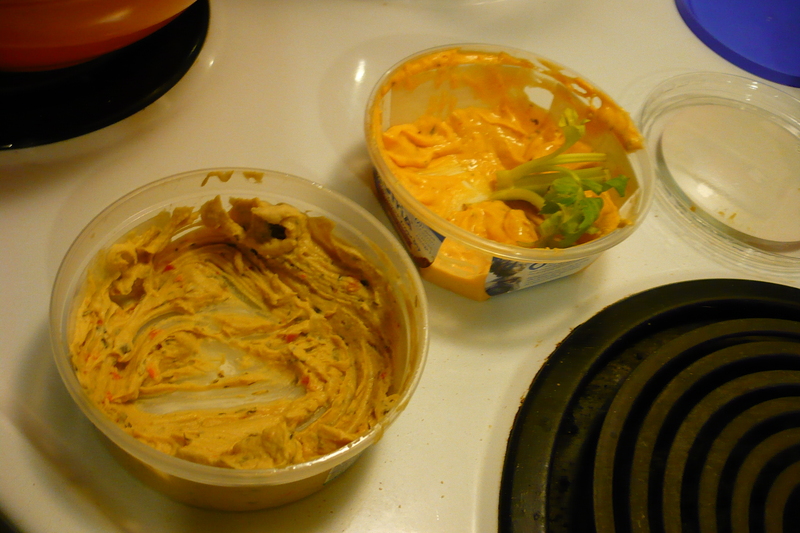 Mmmmm, humus and Greek yogurt veggie dip! 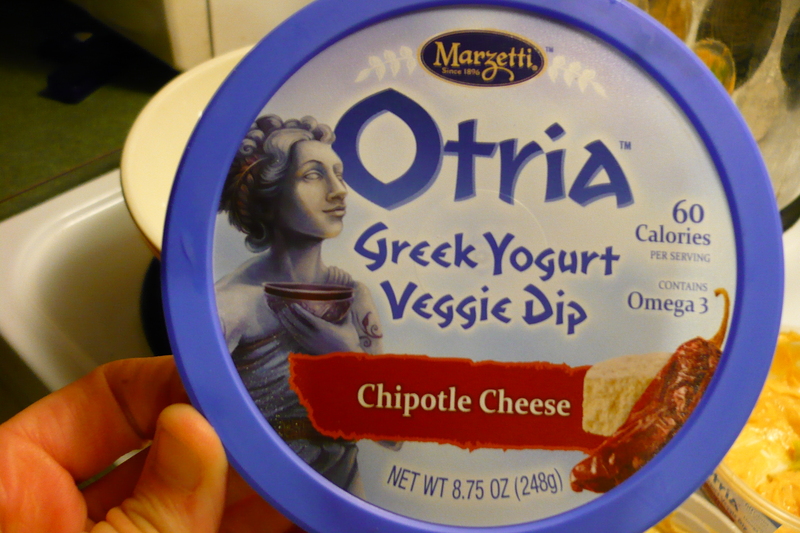 This is the best yogurt dip EVER. Alrighty folks, I’ve gotta get back to my movie. Night!